This Acmon Blue was found in a recently burned area near Camp Creek, Maricopa Co., Arizona. March 2009. 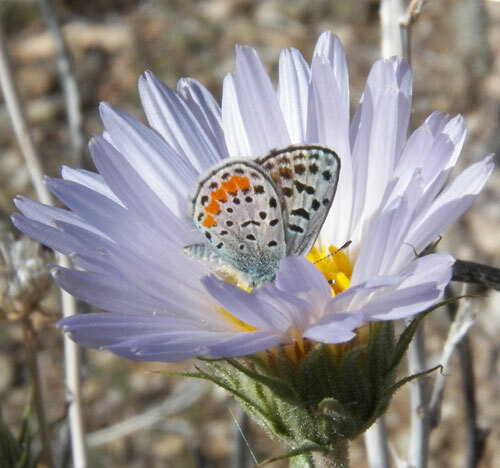 In the Harquahala Wilderness this Acmon Blue was finding it difficult to reach the nectar deep in the flowers of Mojave Aster (Xylorhiza tortifolia). Maricopa Co., Arizona. 11 March 2012. 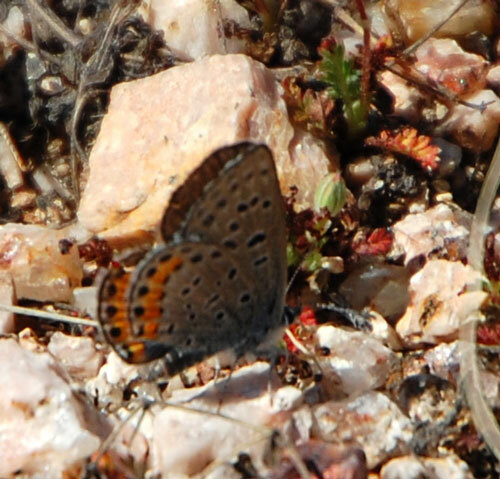 This small blue butterfly (wingspan about 2½ cm) with a band of orange on the dorsum of the hind wing is fairly common on rocky slopes and foothills in the upper elevations of the Sonoran Desert. The slug-like caterpillars use various Eriogonum such as Wright's Buckwheat (Eriogonum wrightii) and Flat-topped Buckwheat (Eriogonum fasciculatum). Sometimes lupines are used. The caterpillars are often tended by ants which protect them and may get sugary secretions in return; it is possible that the caterpillars confuse the ants' chemical communications systems with compounds similar to the ants'. These relationships deserve closer investigation. Butterflies get a lot of attention from entomologists for obvious reasons. As a result the taxonomy is sometimes disputed. There are splitters and lumpers. The latin names at left indicate some of the varied opinions. Given this flux it seems the that the common name is easier to use when referring to this animal. Male dorsum is darker than the female.